The first set of numbers belong to Germany, and represent the total number of vehicles built in 2010 and the average wage of an autoworker in that country. The second set of numbers are the equivalent figures from the United States. In other words, twice as many vehicles are built in Germany every year than in the U.S., and German autoworkers make double what their American counterparts earn. 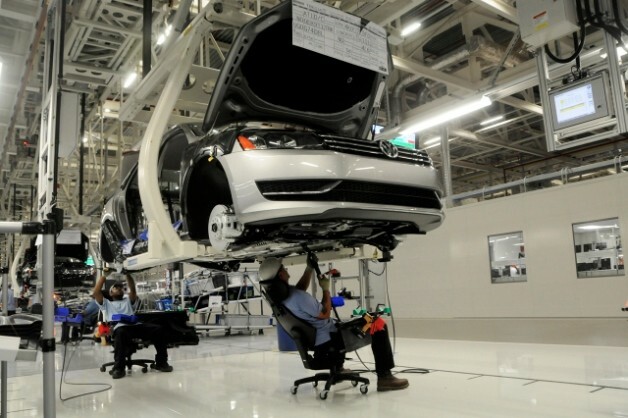 Interestingly enough, all three major German automakers – the BMW, Daimler and Volkswagen groups – operate facilities in both their home market of Germany and in the U.S. And, just as intriguingly, the factory workers in the southern states of America who work for German automakers aren't paid wages that even come close to matching those of their German counterparts. Why the disparity? According to an article from Remappingdebate.org, it has to do with an ongoing "race to the bottom" when it comes to wages in the U.S. and a mutually beneficial working relationship between German automakers and IG Metall, the German equivalent to the United Auto Workers union in the States. In short, German automakers are paying Americans less because they can. There's an entire three-page article with commentary from industry insiders and other experts on the matter, and we suggest you read it for all the details on the great wage disparity that makes the U.S. a low-cost country for German automakers operating outside their home borders.